The BYU-Idaho Clarinet Studio will be giving a recital on Saturday March 23rd at 10:00am in the Barrus Concert Hall. The program will feature works by: Stamitz, Krommer, Kozeluch, Presser, Cavallini, Bozza, and more. In addition to solo repertoire, the studio will be performing works for clarinet choir, including a new composition by one of our clarinet majors, Ryan Terry. The BYU-Idaho Clarinet Studio will be giving a recital on Saturday December 8th at 10:00am in the Barrus Concert Hall. The program will feature works by: Weber, Vaughn-Williams, Templeton, Szalowski, Osborne, and Sutermeister. In addition to solo repertoire, the studio will be performing works for clarinet choir. BYU-ldaho‘s Faculty Woodwind Quintet, Prismatic Winds, will be joined by guest pianist Dr. Andrew Todd, CEO and President of the Grand Teton Music Festival, to perform works by Beethoven, Poulenc, and Shostakovich. The concert will take place in the Snow Recital Hall on Thursday, May 31, 2018 at 7:30pm. You can watch the recital live online at the following address: http://www.byui.edu/music/events/watch-live. The performance will then be repeated in Jackson Hole, WY as a part of the Grand Teton Music Summer Festival on Friday, June 15, 2018 at 7:00pm in Walk Festival Hall. In March, we presented a chamber recital at the Carr Gallery in Idaho Falls, for the Idaho Falls Symphony Chamber Series. We are pleased to repeat this recital at BYU-Idaho on May 10th. This program has a wonderful collection of music from Darius Milhaud, Robert Schumann, Georgina Sanchez, and Johannes Brahms. The BYU-Idaho Department of Music, faculty, and friends will present a concert featuring two ground-breaking works from the 20th century: Copland's Appalachian Spring and Stravinsky's A Soldier's Tale. A pre-concert talk by Dr. Sue Neimoyer will begin at 6:30pm in the Barrus Concert Hall. You won't want to miss this concert! The BYU-Idaho Clarinet Studio will be giving a recital on Saturday December 2nd at 10:00am in the Barrus Concert Hall. The program will feature works by: Weber, Pierne, Crusell, Poulenc, Caravan, and Piazzolla. In addition to solo repertoire, the studio will be performing works for clarinet choir. Concertmaster Emma Rubinstein performs the contemplative Kol Nidrei for solo violin and orchestra during the Jewish Holy Days. We will marvel at nature’s grandeur through the music of Alan Hovhannes, who quotes the songs of whales, and Beethoven’s “Pastoral Symphony” closes the program with a familiar and uniquely Classical celebration. The Idaho Falls Symphony kicks off the 2017-2018 season with a concert in Idaho Falls at Freeman Park. The theme of the concert includes music about Autumn and Summer. For clarinetists, we are performing music from Mendelssohn's Midsummer Night's Dream, including the infamous Scherzo. Having prepared this excerpt for many auditions, it is fun to be able to perform this with orchestra. The full program is below. The concert starts at 5:30pm at Freeman Park on Saturday, September 9th. 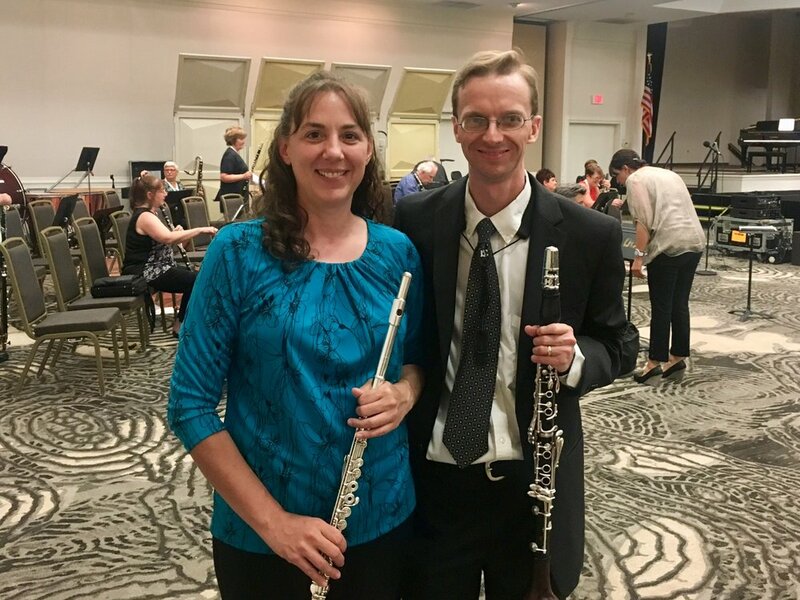 Kristi and I had a great performance at ClarinetFest in Orlando on Saturday July 29th. We performed _e++ for flute, clarinet, and electronics_ by Russell Pinkston. We were part of the electronics recital at ClarinetFest. The program is below.